Alain St.Ange was the former Seychelles Minister of Tourism, Civil Aviation, Ports & Marine. He resigned from his Ministerial position in December 2016 to run for the position of Secretary General of the UNWTO but his candidacy was abruptly pulled out of the race by the Seychelles Government only two days before the elections following demands by the African Union. The letter issued by the African Union threatened serious economic sanctions on the islands if they did not revoke their candidacy for the prestigious role of Secretary General. “A decision of the African Union that is against all basic human rights and the sovereignty of the island state,” said St.Ange who was humiliated at the peak of his tourism career following this unexpected turn of events. Vice President Vincent Meriton of Seychelles called Alain St.Ange, who was already in Madrid for the UNWTO elections with his friends and family, to inform him that Seychelles had bowed to the pressure of the African Union. It is today clear that the authenticity of the infamous letter is questionable, and steps are being taken to investigate this matter. “Africa cannot progress with such a dictatorial attitude, and the World Institutions cannot condone such draconian actions,” Alain St.Ange said as he left Madrid empty-handed to return to Seychelles on 14th May. Not one to be easily deterred, Alain St.Ange has now registered his own Tourism Consultancy Business offering PR and visibility to tourism organisations and destinations, as well as his vast expertise in the development of tourism. His Saint Ange Tourism Report will be weekly and will touch the Indian Ocean Vanilla Islands, the countries surrounding the Indian Ocean, and global tourism matters as and when necessary. The Report will be shared with the Business Community in Seychelles, to the tourism professionals from around the world, and it will be picked up by important news agencies which will ensure a very wide global distribution. Two weeks ago, I was fortunate enough to be on Bird Island in time to witness the breath-taking sight of millions of Sooty Terns flooding in to lay their speckled eggs, an annual spectacle few are able to behold. Bird Island is expecting some two million birds this year to land and nest on the part of the island reserved as the ‘Bird Colony’. The progressive landing of these birds in the period of June to August every year is indeed an impressive sight, and oftentimes may be a deafening experience. This is, without a doubt, something we should all endeavour to strike off our bucket lists. News from Bird Island confirm that the Sooty Terns are already laying. 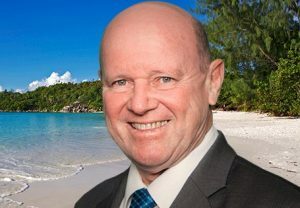 Louis D’Offay’s ‘home grown’ beachside hotel on Praslin Island has been termed the hotel of choice by new Tour Operators promoting the Seychelles. Louis D’Offay remains one of the respected hoteliers of the Seychelles, and his hotel enjoys an incredible beach front location adjacent to the popular Cote D’Or Beach. Cuisine at L’Archipel has remained a strong point of the family run hotel and the personal attention to detail by Louis D’Offay, the owner himself, continues to pay dividends. Lucas D’Offay is today looking at day to day management of the property and Eddie D’Offay is responsible for all the Marketing and Sales. Hotel L’Archipel has just Celebrated its 30th Anniversary. It welcomed its first guest on the 11th of April 1987. The hotel has since become a home away from home for leisure travellers and their numerous repeat guests from around the world. Since April 1987, it has maintained its status as one of the top recommended hotels on Praslin, even in the face of increased competition. On Wednesday 7th June Seychelles was amongst eight countries and organizations honoured for their contributions to global ocean science by the Intergovernmental Oceanographic Commission of UNESCO (IOC) at the UN Ocean Conference in New York in a ceremony called ‘Oceans 8’. The Republic of Seychelles and the leadership of former President of Seychelles, James Alix Michel, was recognized as an ‘Ocean’s 8 Champion’ for developing an innovative debt swap scheme that has enabled this small island developing nation to finance local ocean science and climate resilience programmes. Former President Michel said he hopes this high-level recognition will help to highlight the benefits of applying innovative financing solutions to support ocean science activities around the world. “It is a great honour for Seychelles to be recognized by the Intergovernmental Oceanographic Commission of UNESCO for our work for this gives us an international platform to show the world an innovative model for financing ocean science and conservation work,” he said in a video message from his office in Seychelles, presented at the ceremony. “President Michel has championed the Blue Economy ever since its inception and I think it is only fitting that he and the Republic of Seychelles, should also partake in this celebration. I should also mention that without the support of our international partners; The Nature Conservancy, the Global Island Partnership (GLISPA) and the Commonwealth, we would not have reached where we are,” said Vice-President Meriton after receiving the UNESCO recognition. The ‘Ocean’s 8’ ceremony honouring the champions of ocean science was also supported by the United Nations General Assembly, the UN Environment, Sky TV’s Sky Ocean Rescue Campaign, and the Governments of Iceland and Peru. Lorizon, named after the Creole word for ‘horizon’ on account of the restaurant’s uninterrupted view of the Indian Ocean, has been nominated in the World Luxury Restaurant Awards, CaranaBeach Director, Alan Mason, has announced proudly. Creole themed nights are not a unique notion for Seychelles and many hotels stage such events on a weekly basis, but Denis Island has now launched their own with a playful twist; they are hosting their Creole Nights in the village ‘boat shed’, a charming old building which has been recently refurbished and cleverly repurposed. ‘Boat sheds’ such as this one form part of the unique culture of Seychelles and are traditionally used as a meeting place for discussions and oftentimes for a heated round of dominos. Around Mahé, Praslin and La Digue, many of these beachside sheds have long disappeared, but the owners of Denis Island have not only revamped theirs but have also found a unique way of repurposing it. Denis Island is part of the ‘one island – one hotel’ concept and is reputed to be rather exclusive with its 25 villas and well over 100 staff caring for their guests. This property is managed as a sustainable tourism establishment; it enjoys the luxury of a working farm with fresh produce making them mostly self-sufficient. The island is close to the drop-off thus also providing easy access to fresh fish and great big game fishing opportunities. One night a week the Island’s guests are invited to the village to enjoy a special Creole Night where Francois Hoareau heads a team of Seychellois to put on display an elaborate selection of authentic Seychellois Creole dishes, including a roasted suckling pig. With a bon fire on the beach and the magic of a well-lit moon, guests meet and enjoy a special evening in the company of the island owners, Kathy and Micky Mason. Christine Vel is a quietly ambitious island girl from Mont Buxton, Mahé. She was attached to the Office of the European Director in Paris and has recently been posted to manage the Seychelles Tourism Board’s London Office. Putting Seychellois nationals in tourism promotional offices has been the guiding principle of Sherin Francis, the CEO of the Tourism Board, and recent changes have opened the opportunity for Christine Vel to broaden her horizons as she represents her country in ‘Jolly Old Angleterre’. “I am personally proud of her success and take this opportunity to wish her well” states Francis. ‘Poupette’ has been active for a while and it was difficult to get to know who was behind this Mauritius based Blog. The writer wishes to remain anonymous, but after an unexpected one-to-one meeting on Denis Island in Seychelles, it can be confirmed that the person is a tourism professional with a wealth of experience and a keen eye for detail. Reviews are free, but the product must be good for a recommendation that will enhance the promotion of the tourism business being covered. ‘My Sweet Mauritius’ is the blog issued from Mauritius with a very special character. The blogger has a fresh style, the blogs personal in nature but light in approach. ‘Poupette des Iles’ is published weekly where special discoveries are marked by the “Ayo J’Adore” (Ayo I Love) tag line. Poupette travels independently around Mauritius and publishes all what is discovered in all its diversity, including artisanal works, artists, hotels, restaurants, and boutiques. Exceptional places are all given attention and their due visibility. My Sweet Mauritius: the blog from Mauritius is a must to follow to discover the authentic Mauritius. On the 1st June TAG Heuer announced that they will once again organise their Kitesurf League and that this will be taking place this year on the 17th June, 19th August and 9th September on the C Beach Club at Bel Ombre in the south part of Mauritius. The Indian Ocean Island of Reunion was boasting natural fireworks as the world welcomed 2017; It was on the 31 January at 19h40 that the “Le Piton de la Fournaise” of Reunion started sending red lava spewing into the air once again. “Le Piton de la Fournaise” is one of the most active volcanos of the world and is situated in the centre of the National Park of Reunion. It is listed as a UNESCO World Heritage Site. Vanilla Islands, the six-island destination of the Indian Ocean (Comoros, Madagascar, Mayotte, Mauritius, Reunion and Seychelles) was at the Seatrade Cruise Global in Fort Lauderdale in the USA in March to meet the industry leaders and to better appreciate trends as well as the latest developments. The Vanilla Islands have been having a successful cruise ship season in 2016 and seeking to consolidate the gains made in recent years. Pascal Viroleau, the CEO of the Vanilla islands, was personally representing the Islands and sponsored one of the conferences for some 300 professionals with the MTPA of Mauritius. It was also the opportunity to screen a promotional film and distribute the region’s cruise ship promotional flyer with all of the member states. Tourism Offices and Tourism Boards of the Indian Ocean Vanilla Islands, accompanied by members of their private sector trade, were in Central & Eastern Europe with Turkish Airlines in April for a dedicated Indian Ocean Roadshow to meet the industry’s travel trade. This was a prime opportunity for the Indian Ocean Region to get itself more visibility and for Turkish Airline to spread the news that they have once again been voted the ‘Best European Airline’. After Sofia in Bulgaria, the Indian Ocean Vanilla Islands’ dedicated Roadshow moved to Belgrade in Serbia before ending the three-city tour in Ljubljana, Slovenia. More than 80 Travel Agents and Tour Operators made time to attend the event and to meet with Tourism Officials and with the Trade from the Indian Ocean Region. The Indian Ocean Islands are already well served by Turkish Airlines and this should help facilitate sales from these important source markets. Rwanda’s airline is state-owned and is but seven-years-old. The carrier was initially known as RwandAir Express and operated in those early days with leased turboprop planes. However, Rwanda and its airline has moved to become an Africa wide operator. Today RwandAir has a fleet of 26 aircrafts, including an Airbus A330 and 10 Boeing 737s and they serve 22 destinations. The routes are mostly in Africa and they are set to establish very soon a hub in Cotonou for their West Africa operations. RwandAir is working and proving that Africa can work for Africa. It has been confirmed that from April they will launch a service to Mumbai and by May inaugurated its first flight to Europe through the Kigali-London route. In June they are set to launch a new route to China and by 2018 begin regular flights to the United States of America. Martin Barth, the President and CEO of the World Tourism Forum Lucerne should be congratulated for a very successful 2017 edition. 500 participants from 75 countries exchanged ideas, shared their visions and met new friends. It was fantastic to see how 60 Ministers and even a Prime Minister, CEOs, investors and Professors discussed tomorrow’s challenges in our industry during the WTFL Think Tank in the beautiful Chateau St Charles at the lake of Lucerne. 16 Start-Up finalists made us all proud and showed us how brilliant tomorrow’s business ideas are. The keynote speakers, Simon Anholt, Jason Fox, Ann Sherry, Rasoul Jalali and John Perrottet gave us all food for thought to make sure we can take better and more sustainable decisions in the future. World Tourism Forum Lucerne is and will stay unique by bridging the silos between the public and the private industry, investors and academia and by integrating the Next Generation. Following the recent acts of terrorism (Manchester, London, Paris, Melbourne and Iran) that again shocked the world, the call must be made for Governments and the Private Sector to come together with the Press to find a way forward. The UNWTO and WTTC meeting is a must, but the Press must be invited to be together as partners. The right to information and the right to life and economic survival must be tabled, analysed and joint actions agreed together. During the evening of the 3rd June London suffered from the cowardly acts of terrorism. The World of Tourism from the four corners of the globe stands with London today to say that we strongly condemn this latest attack perpetrated in the heart of London. The world was still getting to terms with the recent Manchester attack, and as the great British People were getting to terms with that incident another blow strikes to disrupt lives in Great Britain. As far away as the Seychelles, sitting right in the middle of the Indian Ocean, but still part of the World of Tourism Alain St. Ange says heartfelt condolences and sincere sympathy to the families and friends of the victims and to the people of Great Britain. East Africa Tourism Platform (EATP) is a tourism private sector body working within the East African Community (EAC). EATP works for the interest and participation of the private sector in the EAC integration process. Since inception in 2012, EATP has managed to facilitate several reforms that have positively impacted East Africa’s tourism industry. EATP has tirelessly engaged policymakers and championed for the private sector. EATP can be credited for successfully advocating for the East Africa Tourist Visa, use of National IDs and the interstate pass as travel documents for citizens, free movement of tourism services as well as joint marketing initiatives. East Africans. Additionally, EATP is running an online East Africa Travel Specialist training program. This program is one of a kind in Africa, covering three countries, where travel agents and tourism operators’ skills on East Africa Travel Geography are sharpened. Moreover, EATP has been facilitating business and networking opportunities for regional travel and tourism practitioners at Kwita Izina, Karibu Fair, Magical Kenya, Kilifair and Pearl of Africa. Over 2,500 regional business operators have been given the opportunity to trade and learn on regional products through B2Bs, exhibitions, trade-fairs and destination trainings. As a result, the number of regional tourists within EAC has been increasing. For instance, in 2015, the number of regional tourists from within EAC member states was over 852,000; representing 65% of total tourist arrivals. As the organization, EATB has played a critical role in the pursuance of a Single Destination Brand Showcasing East Africa as One in Tourism Expos, zero-cost work permits-enabling free movement of labour, Single Tourist Visa, Interstate Passes and Joint Tourism Marketing Committee. In 2016, they joined forces with the governments of Kenya, Uganda and Rwanda, for the first time, to participate in World Travel Market and Berlin International Fair (ITB) under one joint pavilion/stand and banner dubbed ‘Borderless borders; One Destination, One Visa’; signifying that EATP’s efforts of marketing the region under One Stand are receiving endorsement from top political actors within the EAC. At the same time, EATP has solidified the existence of the national tourism private sector apex bodies by making them vocal and authoritative at a regional level, thereby effectively tabling their needs both at national and regional levels. As a result, they have received recognition from across the globe, with notable examples from World Tourism Organization and the World Bank. In the words of World Bank publication (2016) EATP has recently shown leadership in attempting to champion and facilitate a collective, coordinated and simultaneous approach to enhancing East Africa’s competitiveness in travel and tourism. EATP is currently lobbying for the liberalization of EAC air space, sector specific tax reforms and incentives, harmonization of standards and codes of conduct of tourism facilities and services, which will further impact the tourism sector and consequently the region’s economy. East Africa Tourism Platform is showing that Africa can work with Africa for the good of Africa. For a job well done Dr Taleb Rifai, the outgoing Secretary General of the UNWTO, has been honoured by President Uhuru Kenyatta of Kenya and awarded the Elder of the Golden Heart of Kenya (EGH) for his distinguished service to Kenya. This is the highest honour possible by Kenya. Africa says thank you to the President of Kenya and to Minister Najib Balala for bestowing this honour on Dr Rifai. We all know that he has worked tirelessly for world tourism and tried hard to reposition tourism in Africa. Today we are talking about Brand Africa, the narrative we need to write ourselves to pitch our key USPs (Unique Selling Points) and to dispel the often adverse perception being aired about Africa.